Ginger (root) Essential Oil. 10 ml. 100% Pure, Undiluted, Therapeutic Grade. Botanical Name: Zingiber officinalis * Plant Part: Root * Extraction Method: CO2 Extraction * Origin: China * Description: Ginger is a perennial herb that grows to about 3 - 4 feet high (approximately 1 meter). It has a characteristic thick spreading tuberous rhizome. The CO2 extraction method yields a greater number of aromatic compounds from ginger than any other distillation process. * Color: Pale yellow liquid. 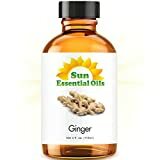 * Common Uses: Ginger Essential Oil is believed by aromatherapists to be applicable for colds and flu, nausea (motion sickness, morning sickness), rheumatism, coughs and circulation issues. It also has warming properties that help to relieve muscular cramps, spasms, aches and ease stiffness in joints. Ginger is also viewed as an aphrodisiac and is believed to ease anxiety, renew vitality and revitalize self-confidence. * Consistency: Thin * Note: Middle * Strength of Aroma: Medium * Blends well with: Bergamot, Cardamom, Black Pepper, Spearmint, Orange, Sandalwood, Ylang-ylang, and other spice oils. * Aromatic Scent: Ginger Root CO2 Essential Oil has a warm, spicy, woody scent with a hint of lemon and pepper. Customers will find it very similar to the powdered spice. * History: The plant is said to originate from India, China and Java, but is also native to Africa and the West Indies. It is believed that ginger was brought to Europe between the 10th and 15th century as both a condiment and spice. It has been used for medicinal purposes since the ancient times; it is recorded specifically in both Sanskrit and Chinese texts. It is also mentioned in literature from the Greeks, Romans, and Arabians. * Cautions: Ginger Essential Oil can irritate sensitive skin. Avoid use during pregnancy.